Recovering from stroke can be extremely lonely – individuals can find themselves trapped within their body, unable to move or communicate in the same way. It can be very distressing. Research shows that music and language are intricately linked in the brain, and that singing is the only activity we do as humans where every part of the brain is engaged. Singing also brings other benefits because it encourages deeper breathing, which helps to prevent infection, supports the body to heal, reduces stress and improves mood and well-being. Singing with others releases the bonding and feel-good hormone oxytocin. 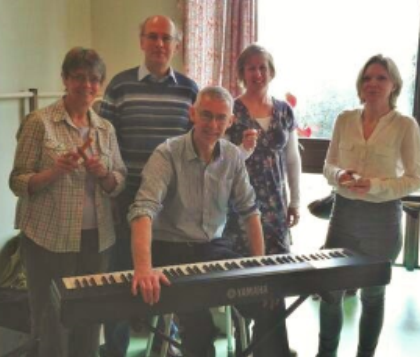 To explore the therapeutic and well-being benefits of singing with stroke survivors, the Ex Cathedra Education Team is working on the Stroke Unit of Solihull Hospital. Using specially developed ways of engaging and enabling participants to sing, the sessions enable many stroke survivors who are unable to speak, to sing. Some patients also seem to have their speech liberated for a short period after a session. The project has become a very important part of the week on the Stroke Unit for patients and staff, with staff even occasionally changing a diagnosis from participating with and observing the patients during the singing sessions. If you would like to make a donation to support Singing Pathways we would be extremely grateful.